What's Holding You Back? No Way! 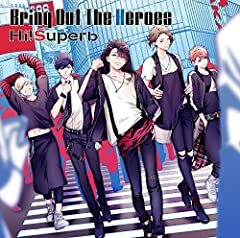 2018.08.29 on Sale Hi!Superb 2nd SINGLE 『Bring Out The Heroes』Music Video. Bring out the heroes -Hi! Superb sub espa?ol. A?n me aterra subir cosas de estos nenes, pero buaaaano~ valen much?simo la pena, y estamos trabajando en nuevos proyectos as? que ?no desesperen! Hi!Superb 2nd Album 01. 《Bring Out The Heroes》 02. 《VIVA!SUMMER》 03. 《Jump the History》 LEO (CV.Mitani leo) RYO (CV.Takijawa ryo) OMI (CV. 2018.05.30Release Hi!Superb 1st SINGLE『Turn Into Love』 SPOT CM 「Turn Into Love」 Track 01.Turn Into Love 02.MugaMuchu☆Life 03.cutie,cutie.